Trees get their water and nutrients from soil, which is made up of minerals and organic materials like leaves, plants and insects. Soil is one of the main factors that influence a tree’s health and growth. There are six basic types of soil: clay, sandy, silty, loamy, chalky and peaty. Clay soil is sticky when wet and hard when dry. There are very few air spaces between the particles that make up the clay. Because the particles are so close together, the soil drains more slowly and nutrients are retained longer. Trees that grow well in clay soil include the white pine, Norway spruce, white cedar, red maples, poplar, European larch and white ash. Sandy soil has the largest particles of all the different types of soil. It feels dry and gritty. Water will drain quickly in sandy soil, which means nutrients will pass through the soil faster. There are several trees that will grow well in sandy soil, like the red oak, white cedar, poplar, Scotch pine, white pine, red pine and European larch. The particles in silty soil are smaller than sandy soil and retain more moisture. Silty soil has a smooth texture that is formed by fine sediments and compacts fairly easily. Loamy soil is a mixture of clay, sand and silty particles. It retains both moisture and nutrients, and is one of the best soils for growing plants. 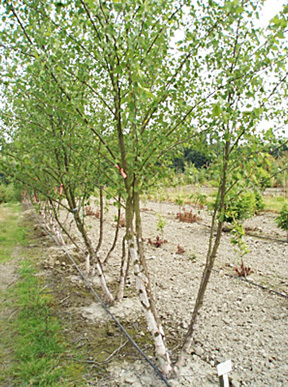 Loamy soil is a good growing environment for the red oak, white and green ash, sugar and red maple, white cedar, European larch, Norway spruce, white spruce and poplar. Chalky (lime-rich) soils are extremely alkaline and drain rapidly. Peaty soil, which is made up of partially decomposed organic matter, is acidic. It retains water but contains fewer nutrients than loamy soils. A big tree specialist can tell you what types of trees are a good match for your planting environment. With expert advice, the tree you purchase and plant will thrive.